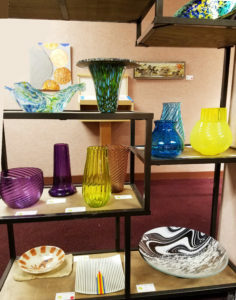 The Glass Art Guild of Utah is excited to be asked back to the Loge Gallery, after a successful show last Spring. This year, our glass will be on display during the performances of Mama Mia, which runs May 11 through May 26, 2018. Make plans now to catch a great show and catch some beautiful glass art on display! Pioneer Theatre Company is located on the University of Utah campus, right across the street from Rice-Eccles Football stadium, 300 1400 E, Salt Lake City, UT 84112. University parking for PTC performances is FREE!